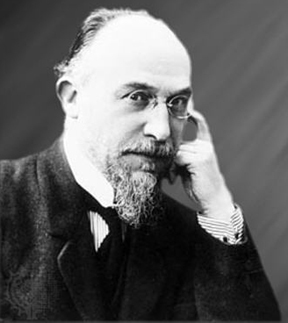 Erik Satie (1866-1925) was a nut, but he did write some wonderful music. Born in Honfleur, he moved with his family to Paris at the age of four. His music always maintains an almost childlike simplicity. The piece which is his most famous is a simple work known as the Gymnopédie No. 1. He actually wrote three and they all have a similar feeling. The first one gained tremendous notoriety when it was used as the basis of the opening selection of the second album by the band Blood Sweat and Tears. In case you can’t remember it (or have never heard it), Listen! Throughout his life he was an eccentric. He grew tired of the attention he had attracted from a lady and so he had a policeman posted outside of his door so when the woman came by, she was told to keep moving because “Monsieur Satie did not wish to be molested anymore.” When he died and people entered the apartment where he had lived for 27 years, they discovered some interesting things. They found many umbrellas, some of which it seemed he had never used, seven identical velvet suits, countless compositions that had been considered lost, many love letters he had written but never sent to Suzanne Valadon. Here's another amusing work by Satie, the third of the Dessicated Embryos. Listen!